PENSACOLA, Fla., Sept. 27, 2017―Twenty area chefs are participating in this year’s WSRE Wine & Food Classic, the public television station’s premier annual fundraiser that covers a weekend each October. Participating chefs include: Billy Ballou, Five Sisters Blues Café; Mike DeSorbo, Culinary Productions; Dan Dunn, H2O Hilton Pensacola Beach; Corey Ernes, Aragon Café; John Huggins, LaBrisa Restaurant; Chrisoula Hulion, Chrisoula’s Cheesecake Shoppe; MariCarmen Josephs, Carmen’s Lunch Bar; George Lazi, George Artisan Bakery & Bistro; Royal Robbins, The Tin Cow; Blake Rushing, Union Public House; John Smith, Hemingway’s Island Grill; Takara Smith, Skopelos at New World; Chris Tingle; McGuire’s Irish Pub; Eric Troup, Margaritaville; Wesley True, The Gulf Restaurant; Brian Vaughn, V. Paul’s Italian Ristorante; Josh Warner, The Grand Marlin; and Mark Williams, Jaco’s Bayfront Bar & Grille. For the “Milestones & Memories” 50th Anniversary Gala on Saturday, Oct. 21 at 7 p.m., three of Pensacola’s most celebrated chefs will present recipes from one of PBS’ most popular TV chefs, Lidia Bastianich of “Lidia’s Kitchen” fame. Executive chefs Dan Dunn (H2O Hilton Pensacola Beach), Irv Miller (Jackson’s Steakhouse) and Gus Silivos (Skopelos at New World) will collaborate to create and prepare the menu featuring dishes from Bastianich’s new cookbook, “Celebrate Like an Italian,” paired with a selection of wines from Silver Oak Cellars. Bastianich will be one of the featured guests on the program during the Oct. 21 gala, along with PBS President/CEO Paula Kerger and Corporation for Public Broadcasting President/CEO Patricia Harrison. Silver Oak Cellars and Republic National Distributors/Santa Margherita are wine sponsors for the above events, which will take place at the Hilton Pensacola Beach on the beachside lawn and ballroom respectively. The WSRE Wine & Food Classic weekend will conclude with an opportunity to meet Bastianich during the “Celebrate Like an Italian” book signing and Silver Oak wine tasting event at So Gourmet & Kitchenry in Pensacola on Sunday, Oct. 22 from 1 p.m. to 3 p.m. Proceeds from all three events will support the WSRE-TV Foundation and the educational mission of WSRE. Individual event tickets can be purchased online at wsre.org/wineandfood or by calling 850-484-1054. Admission to Sunday’s book signing at So Gourmet is free; however, books will be available for purchase, and reservations are requested. The 2017 Wine & Food Classic poster features the original art of WSRE graphic designer Tracey Burgess. 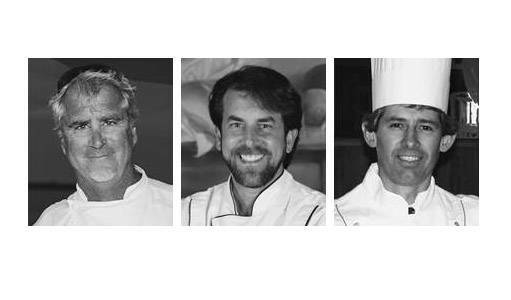 Three of Pensacola’s most celebrated chefs—Dan Dunn, Irv Miller and Gus Silivos—are teaming up for a special dinner presentation at WSRE’s “Milestones & Memories” 50th anniversary gala on Saturday, Oct. 22.